Which Card Tricks Make Good Openers? Magicians are always looking for new and improved ways to hone their crafts and give their audiences a show that is unforgettable. One of the most common and captivating tricks that can be used to set the stage for the rest of the night is that which involves card tricks. 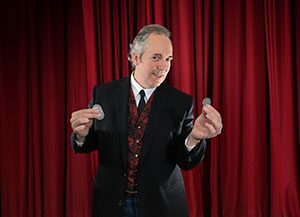 By implementing various types of card tricks and making them appealing to the crowd, it lets magicians draw in their audiences attention for the rest of the night. Magicians are always trying to find new ways to captivate their audiences at the shows. It is understood that getting their attention at the beginning can help maintain it as the show progresses. 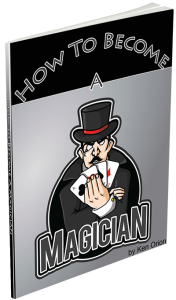 Simple but compelling card tricks are a main staple of any magicians show and can help. The side steal may be the most popular sleight of hand trick out because it is right under the nose of the person that is having the card stolen from them. You can find a lot of people that are impressed by card tricks, but they may have never heard of the bottom palm. You can find a lot of people who understand these different tricks working in casinos for example. Money can be made by casinos because of these tricks. The Blueprint gives aspiring magicians everything they need to know about sleight in order to perform amazing magic. The Classic Pass, otherwise known as The Two Handed Shift, is the process in which you cut the pack of cards while looking like you are doing nothing. Pathways Training goes into specific detail about mastering the sleight and will give you tips on how to achieve the shift quickly. There are tons of books that people often recommend as starter books for learning magic. For example, if you will be doing card magic, check out the Card College series. I wrote about that here: Magic Tricks With Cards: Where Do I Start Learning? 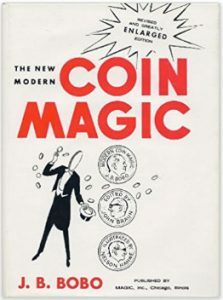 For coins, you’ll almost always be told to get yourself a copy of Bobo’s Modern Coin Magic. I heartily agree that those are excellent starting points. And they will give you the basic foundations you’ll need if you want to really be good. Can I Do Any Tricks Right Away Though? But what if – while you are on the long learning curve to becoming a top-notch sleight-of-hand artist, you want to perform some magic right away? I have the answer to that. It’s Paul Zenon’s Street Magic: Great Tricks and Close-up Secrets Revealed. Why that one in particular? Because it helped me out a LOT. Track 2 Learning – This is where you learn tricks that are easy enough to be performed with only a few hours of study and practice. It allows you to start performing SOME magic right away. The fun that brings, and the rewarding audience reactions will give you the motivation to keep on with your Track 1 studies. I had been dutifully studying Bobo and Card College, along with some other great sources (Eric Jones, David Roth, The Tarbell series, etc.) – this was my “Track 1 Learning” – when I won a door prize at a local magic club meeting (Society of American Magicians). That book was the Paul Zenon book. Well I was going to a party just a few days later and REALLY wanted to have a couple of tricks I could do well, since I would be telling folks I’d taken up magic. Of course they were going to ask for a trick or two, right? But while the stuff I was studying was really long-term, foundation-building stuff, it didn’t really give me much in the way of stuff I could do RIGHT NOW that would be impressive enough that folks would really have fun. But as soon as I started reading “Street Magic,” I found 2 or 3 tricks right away that were terrific and required no difficult sleights or anything. One of the card tricks I still do to this day (which is only 3 years later, but still :-)). I am still working my way through Card College and The Tarbell course. But I think it’s important for you to get the experience of performing quite soon after you start. this will help keep the motivation up while you learn the truly wonderful life-long skills that take a little more time. 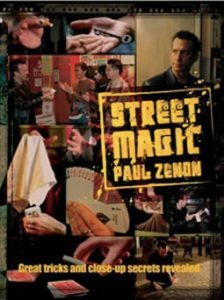 CLICK HERE if you want to grab a copy of Paul Zenon’s “Street Magic” for your own, and get started actually performing some really good magic quickly. As soon as you can provide a professional performance, and want to start promoting yourself, you’ll need a website to showcase your magic. Before I get into the website thing, though, I will stress this: Do not attempt any public performances until you can do the magic without giving secrets be possibly messing up. Just make sure the tricks you plan to do in public are really well-rehearsed. When an magician – ANY magician – gives a poor performance for the public before they are ready, they run the risk of messing things up for ALL magicians. Please give that some thought. But you WILL get to a point when you have enough tricks that you can arrange into a set (highly recommend scripting it), you’ll need – among other things a website. It doesn’t need to be fancy. Here is the result of a single page site (it will be built out as I start getting more experience and gigs) I put together today – Ken Orion magic website. My wife took a picture of me with an iPhone. Then I just put it into this page using WordPress and the Beaver Builder page builder plugin. To become a magician, you obviously need to learn magic. But what does that mean, exactly? In the 1920s, the magician, Harlan Tarbell, started a magic course. He would deliver a kit for each new lesson that contained the various props for that lesson. Theses days, you wouldn’t be easily able to get ahold of the bits and bobs for the kits. But you can VERY easily get started with the Tarbell course immediately. Just CLICK HERE to grab a pdf of the original 60 lessons from the mail order course. Ultimately, over the decades from 1930 through 1995, the Tarbell course was printed in hardback volumes. In total, the entire collection now includes 8 volumes. What is great about the Tarbell Course is that it isn’t just about teaching tricks. That is how too many people go about it. And there is so much more to becoming a magician that just learning tricks. Understanding WHY magic works. What is going on the a spectator’s mind that makes things seem like magic? Being able to perform. A magician is an entertainer. So if you are not a performer – at least on some level – then you are not a magician. Taking the concept of “exposure” seriously. Exposure is the term used to describe revealing the secrets behind a magic trick. Yes, it is super easy these days for people to just go to YouTube and learn some of these secrets. But a magician should not be the person giving these secrets away (unless you are teaching a magician in training or selling magic to people who want to learn). So the Tarbell course includes everything that goes into becoming a magician, going much deeper than just the teaching of tricks. The original correspondence course was 60 lessons covering stage illusions to close-up magic and everything in between. that also includes discussions of stagecraft, developing a show, making your audience laugh and marketing yourself. The electronic version HERE (you can choose instant pdf download or CDROM) includes that original 60 lesson course (almost 1300 pages and nearly 2900 illustrations). 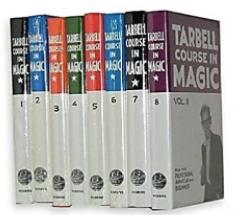 Some time after that original course was developed (in the 1920s), the Tarbell course was redone in order to create that 8-volume hardback series I mentioned above. That was called The Tarbell Course In Magic; For The Professional, Amateur and Beginner. Many other lessons were added to the original 60 lessons. So you can’t really directly compare the original course with the hard cover books. Speaking of the hardback Tarbell Course, you can get yourself a set from eBay (like I did :-)), Amazon (see the link in the pic on the right) or from a number of used book dealers. So even though there are lots of ways to learn magic, Tarbell is one of the best ways to start. It has been for almost a hundred years. Coin magic is the kind of magic that I like best. And a coin trick is the first bit of magic that I showed to non-family members and looked like “real” magic. That coin trick is called Tenkai Pennies. It’s been around since around the middle of the 20th century. It’s a super clean trick that uses two coins. Ironically, hardly anyone does it with actual pennies, since those are such small coins. Usually people use half-dollars or even dollar-sized coins. What So Special About This Coin Trick? I mentioned that the trick is super clean. What I meant was that Tenkai Pennies uses no gaffs or gimmicks. Nor does it rely on extra coins. What you see is what you get – one coin moves mysteriously from one hand to the other as if by magic. It’s pure sleight of hand. And that is what makes it so special. You can do this trick with any coins. So that means you can borrow coins from someone and do magic with their own money! The other special thing about this trick is that it relies on a sleight (“the use of dexterity or cunning, especially so as to deceive”) that is relatively difficult. That means that a lot of magicians will not bother learning it. I would rather not – in this open post – specifically say what that sleight is*. Magic should retain some mystery, right? But what I will say that it has been SO worth it to learn this little move. And since many magicians don’t bother with it, you’ll be that much more ahead of the other magicians if you put in the time and effort. * Click Here to send me a message if you’d like to know what the sleight is :).